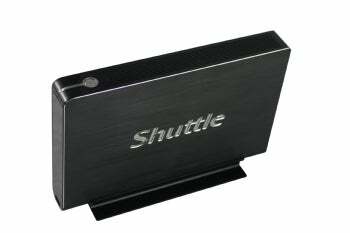 Earlier in the year, popular small form factor PC maker Shuttle announced it would be releasing its smallest home theatre PC yet, the XS35--a tiny 1.5 inches thick. The company has since decided to add three different configuration options to choose from, all with the same 1.5-inch-thick chassis. The three options have been designed to appeal to the typical types of users of HTPCs — media users, HD media users and the everyday use user. XS35 intended for everyday use has an Atom D510 CPU, 1GB RAM, Wi-Fi, a 160GB hard drive, and an Intel GMA 3150 graphics card. Meanwhile, media users also get Atom D510 CPU and GMA 3150 graphics card, but 2GB RAM, a slim DVD burner, and a 320GB hard drive for their buck. If HD's your thing, Shuttle offers the XS35 GT, which has 2GB of RAM, a DVD burner, 500GB of storage, Wi-Fi, and all the other perks of the lower end models. They also get the more powerful Nvidia Ion graphics chipset, with supports 1080p video playback. The three options are ready to ship from retailers in both the US and Canada. They cost a very tempting $240 for the basic model, $280 for the media configuration, and $380 for the XS35 GT. Would you buy one of these configurations? Tell us in the comments below.